In my studies dealing with the history of the inland waterways, one story truly embodies the bravado of the river. This tale reflects the persona of the brave, adventurous, self-assured, hard living and hard drinking people of the river. 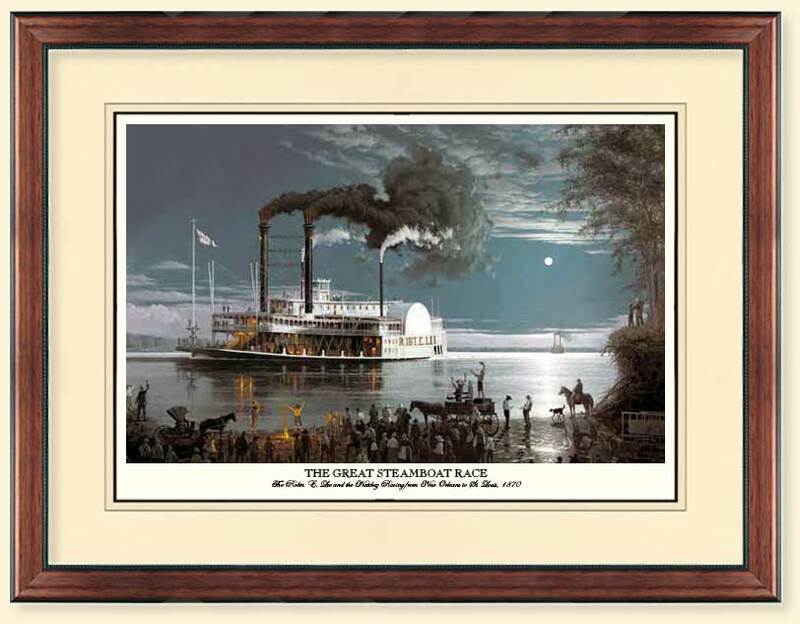 That event was the Great Steamboat Race of 1870 between the Robt. E. Lee and the Natchez. This milepost marked the highest point on the graph of the rivers in terms of their importance to our country before the dominance of the railroads. This type of event never happened again; and, the grand vessels of the steamboat era began to go into decline. This race found two huge 300 ft plus steamboats racing all out up the Mississippi River from New Orleans to St. Louis at speeds up to 23 mph. The Robt. E. Lee won the race in a time of 3 days, 18 hours, and 14 minutes, a record that remains to this day for a vessel of that size. The race was our country's first media event as huge sums of money were wagered, large crowds traveled considerable distances to line the banks of the river, and the new telegraph broadcast the progress of the race to a national audience. 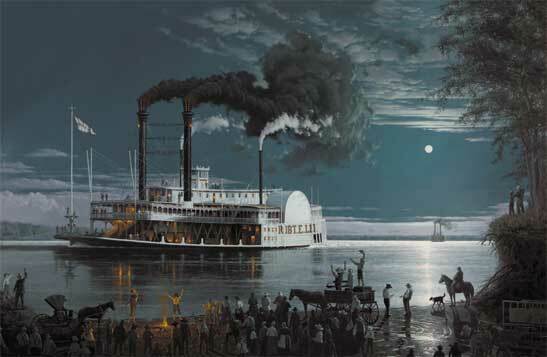 My depiction of the grand steamboat passing before the large cheering crowd with fire visible from her chimneys reflects the emotion and grandure that would have been invoked on the citizens at that time.